I find it odd how your perspective on any given situation changes from time to time, or moment to moment based on your current situation or past experiences. Living in a hospital is like entering some sort of alternate universe where time is completely relative. You never know if you have been here for two week or two months or if one of Ned's episodes has lasted 20 minutes or 4 hours. In fact, Everything in a hospital is relative. I'm never sure how to answer extremely easy questions like, "how are things going today," or "How are you feeling about his current condition". It just depends on the point of reference to which I am refering?? I always find that in a hospital, my perspective about myself changes. I honestly live my life with me at the center of my universe. Of course, when I say "me", I include MY children and all MY interests and MY responsibilities. But here, all of MY problems can't so easily be exaggerated in my mind. There have been times here, when I find it difficult to pray for my son. It isn't that I don't believe the Lord wants me to lift my son up to Him, but it's just that I think so much about how much Jesus taught us to love our neighbor as ourselves and how can I sit here and see the suffering of others and not be moved to share in their heartache as well? I know that our situation with Ned is extremely difficult, but there are so many other parents who are facing terrible circumstances with their own children and the hurt in this place is so intense. I look in the faces of other mothers here and I wish so much to be able to take their pain away because I know the unbearable the burden of their fears. I have been so very frustrated with the lack of progress in Ned's condition lately; however, recognizing the trials of others here has helped me to be thankful for the healing he has received so far. I am just asking that as you lift Ned up in prayer (I know many of you do often and I praise God for your dedication), please pray healing over this entire unit. This is a place where miracles are seen as often as tragedy; but, somehow, it seems the fear of an unwanted outcome has set the tone around here. Thank you all for your continued support- as you have added Ty and Camilla to your prayer list, also add the baby in room 13 who had to be placed on ECMO today. I know I had promised to update more frequently as of last week; however, Ned's week really went downhill last week and the recover has been an effort. 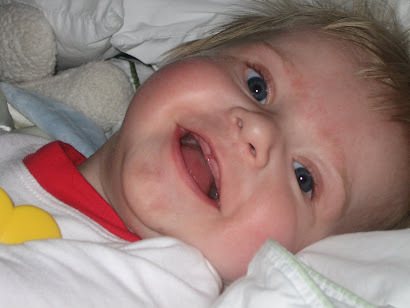 Last Thursday, Ned was diagnosed with pneumonia and MRSA sepsis. It initiated such a vascular balancing act that we got very close to a point where I felt we may have to let him go. It just so happened that a last ditch effort by his doctor at the moment returned him to the upswing- Thank the good Lord for Dr. Primis!! One thing I really wanted to share was how I have know that God had prepared me for this situation with Ned. On the Saturday prior to Ned's accident on Sunday, I dropped in my parent's house to let their dog out while they were out-of-town. I picked a book off the shelf called "The Hiding Place." Nothing flashy or fancy about the book, in fact it looked ages old, but it caught my attention. I read much of the book prior to bed and then woke at 2am and finished it before Sunday school. That is extremely out of character for me. I never awaken during the night unable to sleep and I haven't read a book in a day since, maybe, college (actaully more likely to have been in the interest of meeting a due date). In my opinion, the book is profound. The jist of the book is that there are these two sisters who assist Jews in the underground effort to escape Nazi rule. Their father has taught them all this Biblical truth all their lives and they use his wisdom as teaching tools in the concentration camps (true story). The lesson I most took away from the book was their ability to thank God and give glory to God regardless of the situation at hand. As soon as Travis handed me Ned that Sunday, although he was blue and not breathing, there was within me somewhere a small voice reminding me that if God was present in the Nazi concentration camps, then He was present here; if He could work miracles there, then he could work them here. The truths in that book have allowed me to remain focused on the positive and to give thanks to God for the small things we have or little blessings received. It also leads me to be thankful for the annoyances in life!! I now know why I grabbed that book and why I stayed awake all night reading it. I needed to know that God's grace and mercy sometimes takes the form of fleas (you'll have to read it)! There is certainly a part of me that had hoped never to post on this blog ever again. I had basically used this format as an outlet to express, not only Ned's current medical condition, but also, how the Lord was working in my life and heart through those situations. I was definitely living in a place where I assumed all those times were behind me. There was a part of me that was missing feeling the closeness of the Lord in my life, but I wouldn't have opted to return to a critical care unit to rekindle the relationship? 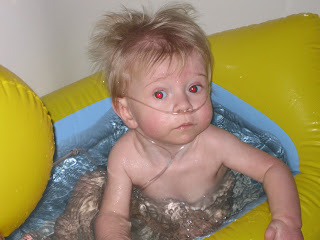 On Sunday, July 5, Ned nearly drowned in the bath. Since then he has been at Levine's Children's Hospital in Charlotte and is in critical condition. I am at a complete loss for how I feel about our current situation and about my sick child. I am completely and utterly wrought with guilt. I have apologized to Ned a million times in that hospital room and to my Savior for being so irresponsible for such a precious gift in my life. I am coming to a greater understanding of guilt and its crippling affects on the spritual lives of people. I have always thought that I understood why people who had made terrible "lifestyle choices" had a difficult time letting go of their guilt and accepting the forgivness of Jesus; however, my "understanding" was extremely abstract and distant, at best. Guilt oppresses you in a very internalized approach. I don't feel like I deserve to take my guilt to the cross and lay it down, and for that matter, I don't want to. I don't want to feel better while my son is struggling to live in a hospital bed. The most difficult concept for me to grasp at the moment is that I have never "deserved" to take my burdens to the cross....it was never a priviledge I had earned for any good merit or behavior. When you have to watch your children suffer for your misgivings, you desire to suffer as well. I know every parent in the world will tell me that it could have just as easily been their child, but it wasn't....it was mine. It's not that he went under that haunts me at night, it's knowing that when he couldn't help himself, he was desperately wanting and needing me to rescue him and I never came. I am asking everyone to pray for Ned. I am praying for his peace and comfort....that is what I most desire for him. While every fiber of my being wants him back on my hip, clinging to my shoulder, I most want him to feel the peace of God. I have more that I would like to share about how God prepared me for this latest journey, but I don't have the endurance tonight to relay it...hopefully tomorrow. Much love and many blessings! Who can believe that Ned turned a year old this week? I have spent much time reflecting on his life and our journey this week. While I often find myself frustrated with not being able to resolve Ned's GI issues, I am amazed at how far he has come. I have read back over this blog around the time of his birth and in some ways, I vividly rem ember that life and being that person and in other ways, it seems like I'm reading about someone else's life? Ned's life has not only deeped our faith he has strenghtened our character. We have endured a process that has taught us patience and we have learned that joy is completely independent of of your situation at any given moment....the absence of hardships doesn't guarantee joy, nor does the presence of hardships squelch it. Every day, I look at my family and my children and my heart is completely overwhelmed at the life God has granted to me. I think often of how precious life is. In the past year, I have gained a better understanding of what it is to receive eternal life and the life more abundant. I used to believe those terms had different references, but now I understand that our eternal life starts NOW...it is the life more abundant. For some reason, I used to related eternal life to the life in heaven after you die, but I now believe that Jesus meant for us to have that life beginning now. It has been difficult for me to hang on to that life in the past year specifically since we brought Ned home from the hospital. Once his medical care was completely my responsiblity, I had a hard time not attempting to control every detail and micro-managing his care. It is a real effort for me to continually place his care and the feet of my Lord and allow him to completely restore Ned's body. Until I read back the past week, I had practically forgotten that "complete restoration" was my original prayer. I had come to a place of trusting God with the details and the timeframe, but continually praying for and believing in, complete restoration. I am working myself back to that place of surrender with God. 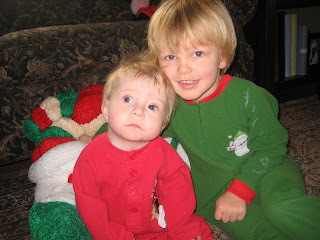 Although Ned was a much sicker baby at that time, I lived in greater peace. I don't have any birthday pictures as of yet. My parents are out of town this week and since the grand parents are the only people invited to the party (to prevent germ exposure), we're delaying the party till they return. Ned has no idea it is his birthday, nor does he eat cake, so we don't feel like there's any harm in delaying. I'm not sure if I have mentioned it yet, but Ned is saying "mama" all the time now (Meanwhile, Jack, age 3, has started calling me Mom...like he's 15?)!!! We can't get him to say anything else, but he has gotten some teeth so maybe that will help with his speech. I though he would never get teeth, but a couple of weeks ago, he had four come in within a 3-day span of time. It wasn't Ned's most pleasant week, but he looks so much older all the sudden. He started to get the two outside upper teeth first and I was so afraid he was going to look like a vampire, but the center two popped right in there....thank goodness! His pediatrician told me not to worry about the teeth being out of order, apparently Ned "didn't get the manual". I assured Dr. Cerjan that Ned apparently missed manual distribution day, because he hasn't followed one protocol yet! Other than the lingering GI issue, life is good and I'll post with some birthday party pictures once we have the little shin-dig! Much love and many blessings! I can't say I know how time has gotten away from me so over the past several months other than to say we have been on a rollercoaster with Ned's feeds. It has consumed our lives to say the least. He still really isn't tolerating his feeds that well, but after a failed surgical procedure in Charlotte, we have taken him back to Chapel Hill where we feel like we'll eventually get to the bottom of it. He is currently down 2lbs. and just can't take very much volume at a time at all. He is refluxing and having bile in his tummy again. Everyone is certainly perplexed about what is going on with him, but I am hoping for some resolve in the near future. He is a completely different child when he is feeling well. I hate to see how he struggles and seems to be in pain during every feed. It is such a dread for me to have to start his feeds and he cries from the beginning like he knows it is going to be painful. Please pray that the Lord will grant Ned some rest and will heal whatever it is in his little GI tract that is so whacked out at the moment. 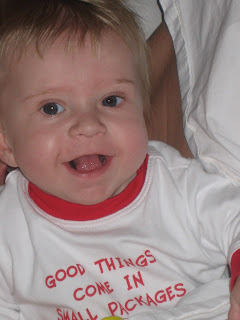 When he isn't eating, Ned is very affectionate now and laughs and smiles all the time. All his seriousness has somewhat disappeared. I'm going to post some recent pictures of him and Jack and I'll update after Christmas. I hope everyone has a very Merry Christmas and very blessed New Year! You have all played a very important role in our 2008 and I am thankful for your continued prayers and support. Ned has made major strides in his physical therapy this week. He is rolling onto his stomach (assisted), and tolerating it very well. He's even moving his little legs like he want to go somewhere. He is also holding his weight on his hands and knees. I suppose he'll be wanting to start crawling soon, I'm just not sure how we're going to manage that since he's connected to feed and oxygen all the time. That will be a little project for me. Ned has also been sitting up all by his self this week. He doesn't sit very long, but his endurance and strength is definitely improving. I've been so proud! On the downside, we're back to gagging and yacking up spit again...not tolerating feeds. I'm starting to think it is another stomach ulcer? The doctor called in some medicine for it yesterday so I guess we'll just see how it works? Please pray about it. I'm so hoping he can continue to tolerate and stop the spitting up so we don't have to change is feeding tube to the one that keeps him on continuous feeds....that may really slow him down as far as mobility. Travis and I have been asked to be a part of the radio-thon in November to help raise money for the UNC Children's Hospital. I am so excited to be able to share with people and raise awareness for CDH, as well as, praise the doctors and staff there who were so wonderful with healing Ned and in their treatment of him. Please keep the three CDH babies currently in the hospital in your prayers (links to their websites are above): Nayeli in San Fransico, Carter at Duke and Lizzy Jo at UNC. I hope to post some Halloween pictures of Jack and Ned, but it all depends on Ned's mood this afternoon.....it hasn't been all that pleasant this week.